The Land Transport Authority (LTA) will be calling several tenders for the construction of the 21.5km North-South Corridor (NSC) in the coming months. 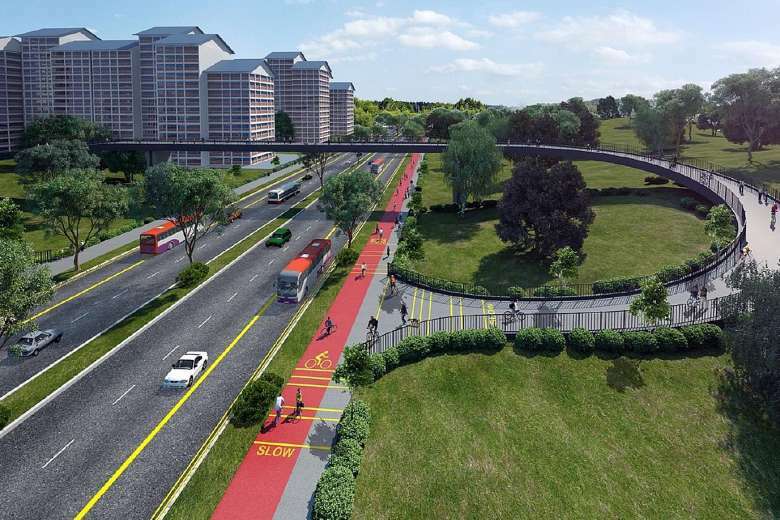 With the aim of connecting towns in the northern region to the city centre, the NSC is touted as Singapore’s first integrated transport corridor, featuring continuous bus lanes and cycling trunk routes, said the LTA. Aside from making it easier to travel between Woodlands, Sembawang, Yishun and Ang Mo Kio, the continuous bus lanes are expected to reduce travelling time to the city by up to 30 minutes. Cyclists can also look forward to the biking trunk route, which will link the various park connectors and dedicated cycling paths within the HDB towns along the corridor to downtown. “The reconfigured NSC will open up new and exciting transport opportunities for Singapore, especially for residents staying along the NSC,” said LTA’s Chief Executive, Chew Men Leong. Major construction works are expected to start in 2017 and the NSC is expected to be completed around 2026. Artist’s impression of dedicated bus lanes in tunnels and on surface roads. Meanwhile, the LTA has awarded two civil contracts for the construction of two MRT stations along the Thomson-East Coast Line (TEL), with a total value of about $334 million. Singapore’s Woh Hup will build Amber MRT station for a contract sum of $146 million, while MCC Group’s construction unit, China Jingye Engineering Corporation Limited (Singapore Branch), won the $188 million contract to build the Bedok South station and its associated tunnels. The TEL’s 13km East Coast stretch will serve residents living in the eastern part of Singapore who are not directly served by the existing rail network, such as those in Tanjong Rhu, Siglap, Marine Parade, Upper East Coast and Bedok South. It is targeted to be completed in two phases, with the first seven stations from Tanjong Rhu to Bayshore expected to be ready in 2023, while the remaining two stations are scheduled to be operational by 2024.